Visa is a document which allows foreign citizen to travel into a specific country and stay there for a set period of time. Generally, a visa is issued at the Consulate of the country or, in some cases, at the border. 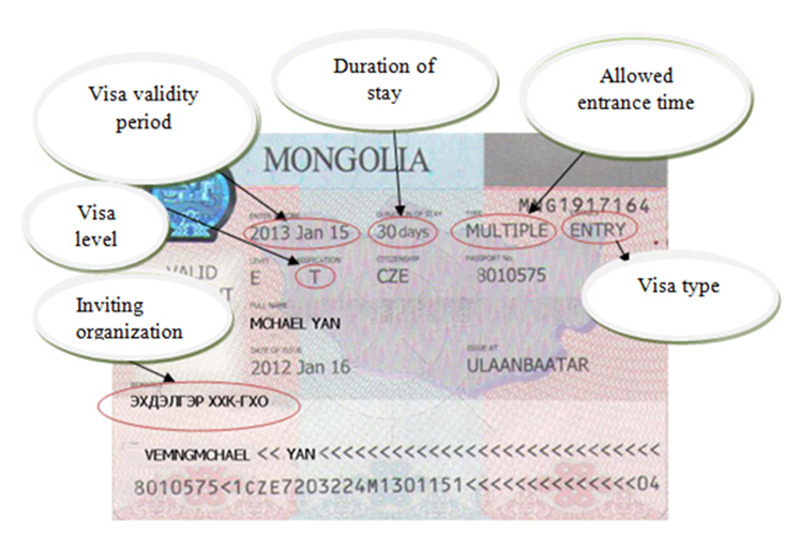 Mongolian visa is glued directly into the passport as photo is shown below. Mongolia has reciprocal agreements with certain countries that waive visa requirements. It is important to research visa requirements before traveling internationally to avoid any issues with border control officials and airlines. If a destination country requires a visa and the traveler does not have it in his/her passport, the airline may refuse to board this person on the plane. Diplomatic passport Type “D” Type “D” visa is issued to foreign citizen holding diplomatic passport or an UN official with the red laissez-passer passport to visit, or reside in, Mongolia on diplomatic purposes. 3. Applied to foreign citizen with official or regular passport visiting to work in Mongolia under an inter-governmental agreement. 2. A senior manager to work in a joint venture, branch, or its representative office. Type “HM” Applied to a foreign media organization member to visit, or reside in, Mongolia for the purposes of media reporting. Type “O” Visa is applied to foreign citizen with official or regular passport to visit, or reside in, Mongolia upon an invitation by a non-governmental organization, international humanitarian organization. Type “S” Visa is applied to foreign citizen or stateless person visiting Mongolia for the purposes of studying, retraining, internship, research irrespective of his/her passport type. Exit – Entry shall apply to a long term business resident who temporarily leaves Mongolia for no more than 90 days, or to a permanent resident, emigrant, or stateless person who temporarily leaves Mongolia for no more than 120 days. Exit shall apply to foreign citizen, stateless person who is temporary or permanent resident for business or personal reasons who leaves Mongolia for more than 90 days or for good. Transit shall apply to a foreign citizen or stateless person for transiting through the territory of Mongolia. Foreign citizen resided in Mongolia with a permission on business or study purposes for more than 90 days will be addressed as a permanent resider on official purpose. The permission on permanent residence on official purpose for foreigners will be provided by the OINFC according to the permissions given by the administrative organizations on the same duties. Visa expiration date shall be counted from the next day of foreigner arrival day. Indian ordinary passport holders are exempted visa fee for 100%. Hong Kong diplomatic passport holders are exempted visa fee for 100%. According to the law “Stamp Duty” The following conditions reduced or exempted from the visa fee for foreign citizens. Visa fee is not same for each visa type. The following fees are classified as visa type. Visa fees for only USA citizens. The following materials are required, If you are requesting a TOURIST VISA not exceeding 30 days. The following materials are required, If you are requesting a MULTIPLE VISA. The following materials are required, If you are requesting to extend your VISA STAY. If applicant is not present itself it can be authorized by another person on behalf /with accreditation or work identification/.Officer Immigration of Mongolia has right to call foreigner for additional document or for an interview.Visa will extend up to 30 days once in a six month.